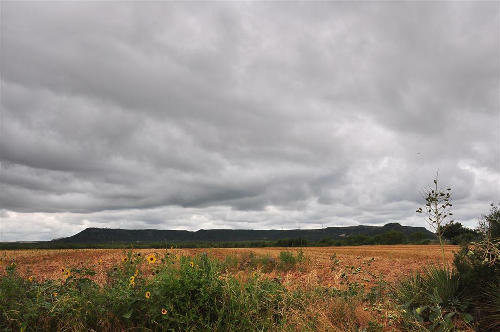 Mount Pleasant, Texas, Taylor County ghost town, and Castle Peak. 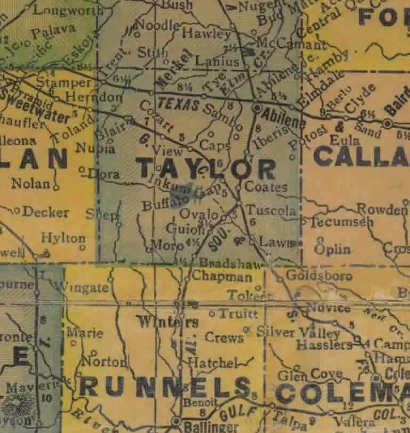 In 1909 a two-teacher school was built but no population count is available for the community. It’s reported that Mount Pleasant had a church, school, and “a number of scattered dwellings” in 1940. Today only the scattered dwellings remain – and the fortress-like Castle Peak. 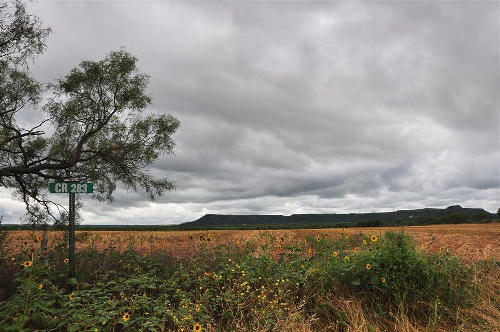 The Butterfield Overland Mail, the first public transportation facility spanning the area from the Mississippi to the Pacific with passenger and mail service, 1858-61, used the 2400-foot peak to the northeast as a beacon. The drivers and passengers viewed it for 30 to 40 miles. In that era it was called Abercrombie Peak, for Colonel J. J. Abercrombie of the U.S. Army, active in defense of this frontier. 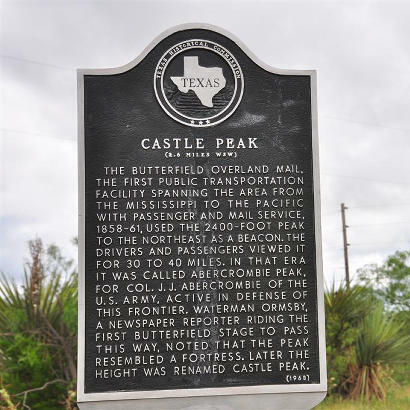 Waterman Ormsby, a newspaper reporter riding the first Butterfield Stage to pass this way, noted that the peak resembled a fortress. Later the height was renamed Castle Peak. 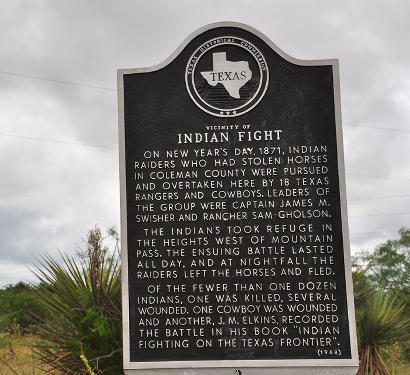 On New Year's Day, 1871, Indian raiders who had stolen horses in Coleman County were pursued and overtaken here by 18 Texas Rangers and cowboys. Leaders of the group were Captain James. M. Swisher and rancher Sam Gholson. 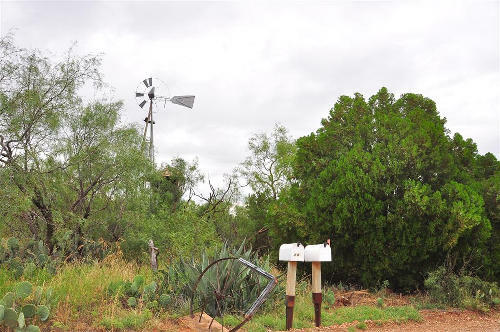 The Indians took refuge in the heights west of Mountain Pass. The ensuing battle lasted all day, and at nightfall the raiders left the horses and fled. Of the fewer than one dozen Indians, one was killed, several wounded. 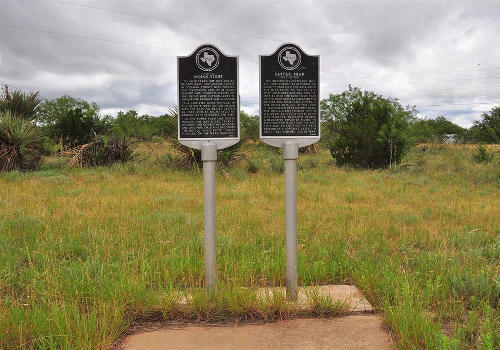 One cowboy was wounded and another, J. M. Elkins, recorded the battle in his book, "Indian Fighting on the Texas Frontier."